A parliamentary report of 1777 recorded a parish workhouse in operation at Sandon with accommodation for up to 25 inmates. Hertfordshire: Anstey, Aspeden, Broadfield, Buckland, Cottered, Great Hormead, Laystone (3), Little Hormead, Meesden, Rushden, Sandon (2), Throcking, Wallington, Westmill, Wyddial, Yardley. The population falling within the Union at the 1831 census had been 6,327 with parishes ranging in size from Broadfield (population 10) to Laystone (1,093). The average annual poor-rate expenditure for the period 1832-35 had been £4,615 or 17s.7d. per head. 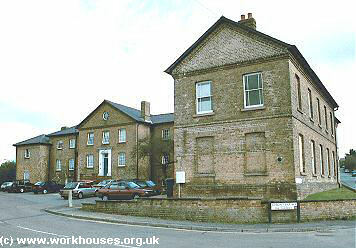 The new Buntingford Union workhouse was erected in 1836-7 at a site to the south of the town. It was designed by William T Nash, a Guardian of the Royston Union whose workhouse he designed, together with others at St Ives, Halstead, and Caxton and Arrington. Intended to accommodate 160 inmates, the Buntingford workhouse adopted a somewhat unusual courtyard plan, with the two-storey buildings forming a quadrangle around the inmates' exercise yards. The workhouse location and layout can be seen on the 1897 OS map below. The front block ground floor contained a porter's lodge and clerk's office, dining-halls, kitchen and chapel. Stores, washhouse and laundry were in the basement below, and bedrooms, sick-rooms and the Guardians' board-room were on the floor above. The layout of the ground-floor is shown in the plan below. A new wing was added at the south-west corner of the site in 1872. This contained a new board-room, dining hall and clerk's office. Buntingford from the south-west, 2001. The Master's accommodation projected from the rear of the front block, overlooking the inmates' yards. Buntingford from the south-east, 2001. Buntingford workhouse - aerial view, c.1929. 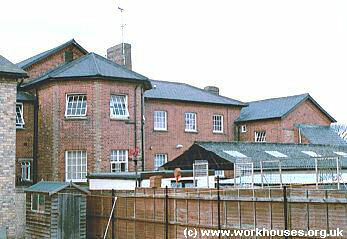 The workhouse closed in 1933 and later housed offices of the local Rural District Council. The front block of the building survives. Hertfordshire Archives and Local Studies, County Hall, Pegs Lane, Hertford SG13 8DE. Very few records survive — holdings include Guardians' minutes (1846-1930); etc.